The Book Chook: Literacy Lava 6, Out Now! Literacy Lava 6, Out Now! The sixth issue of Literacy Lava, a free pdf for parents or anyone who wants kids to love reading, writing and communicating, is now available from my website. Clicking on this link will take you to the exact page where you just have to click the cover of Literacy Lava 6 to download it as a pdf. 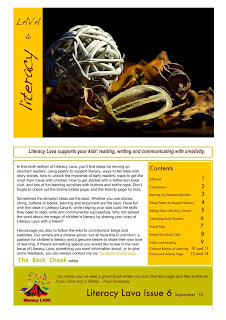 In this sixth edition of Literacy Lava, you’ll find ideas for revving up reluctant readers, using poetry to support literacy, ways to tell tales with story stones, how to unlock the mysteries of early readers, ways to get the most from travel with children, how to get started with a father/son book club, using newspapers to build literacy, and lots of fun learning activities with buttons and bottle caps. Don’t forget to check out the Online Extras page, and the Activity page for kids. Admittedly as editor of Literacy Lava I am likely to be prejudiced, but I believe contributors have come up with more fantastic articles in this issue. I hope you'll take the time to read, tweet, and send the link to anyone you think would find it useful. Thanks to all the lovely tweeps below for sharing the news about Literacy Lava! great! i really love the ideas presented. would be sharing it on my blog soon! I've written what I like about Literacy Lava since I first discovered it a few months ago ( I believe it was the 4th issue then). I must say that this issue, just like those before it, is amazing! I'll be shairng it on my blog of course! I agree with you, Literacy Lava is so well crafted! Saara, thanks for the great feedback!